District 1 – Shawnee Mission East outscored Shawnee Mission North 56-34 on Thursday night to win the District 1 championship. The Lancers and Indians will now await their seeding which will be determined by Friday night’s action. District 2 – In what looks like a great game on paper, Blue Valley North will travel to take on Shawnee Mission West on Friday to decide the District 2 title. Both the Mustangs and Vikings have already qualified for the playoffs. 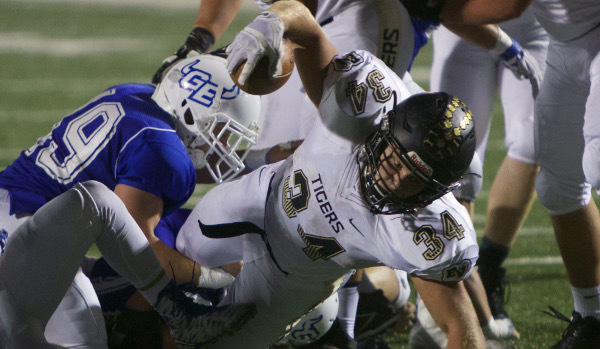 District 3 – Eastern Kansas League rivals Blue Valley Northwest and Blue Valley will meet on Friday to determine the district championship. The Northwest Huskies entered district play at 0-6, but have picked up wins over struggling programs Olathe South and Gardner-Edgerton. The winner of this game will likely get the No. 4 seed on the eastern side of the bracket. District 4 – Top-ranked Lawrence clinched the District 4 championship with last week’s dramatic 31-28 win over Olathe North. The Lions travel to Olathe East this week with a chance to wrap up the No. 1 seed with a win. Olathe North will host Olathe Northwest with the winner claiming the runner-up spot in the district and the second playoff spot. District 5 – Topeka High and Lawrence Free State have each already qualified for the 6A playoffs and will decide the District 5 championship tonight in Lawrence. The winner advances as the champion, with the loser going as the runner-up. District 6 – Junction City has clinched at least a playoff spot as even if the Blue Jays lose to Wichita North they would finish in the top two in regards to district points. North can win the title by beating Junction City and hoping for Wichita East win over Wichita Southeast. Southeast can grab the runner-up spot by beating Wichita East and hoping that Junction City handles North. Wichita East has already been eliminated. District 7 – Derby and Wichita West have each qualified for the playoffs. Derby travels to West tonight with the winner claiming the district championship, and the loser advancing as the runner-up. District 1 – Leavenworth and Lansing will square off on Friday to determine the District 1 championship. The winner qualifies as the champion, while the loser qualifies as the runner-up. District 2 – The District 2 championship will once again come down to Shawnee Heights and Topeka Seaman. The T-Birds and Vikings will meet Friday with the winner advancing as the district champion. The loser qualifies as the runner-up. District 3 – Mill Valley is the District 3 champion by virtue of wins over St. James Academy and Bonner Springs. The St. James Thunder and Bonner Springs Braves will play Friday at St. Thomas Aquinas with the winner advancing as the district runner-up. District 4 – St. Thomas Aquinas will travel to Hutchinson Field in Pittsburg to take on the Purple Dragons for the District 4 championship. The winner advances as the District 4 champion, while the loser qualifies as the district runner-up. District 5 – Wichita Heights will travel to take on Kapaun Mt. Carmel tonight in a game that will decide the District 5 championship. The winner will qualify for the playoffs as the district champions, while the loser goes on as the runner-up. District 6 – Great Bend will travel to Salina South on Friday to determine the District 6 title. The Panthers and Cougars have both already qualified for the playoffs. Great Bend will make its first playoff appearance since 2010. District 7 – Bishop Carroll has clinched a playoff spot and can wrap up the district title with a win at Valley Center. Valley Center can secure a playoff spot by beating Carroll by at least 18 points. The Hornets can win the district title with a win over Carroll and a Maize South loss to Maize. Maize has been eliminated, but the Eagles can cause some chaos by beating Maize South. That coupled with a Carroll win over Valley Center would create a three-way tie for the runner-up spot and district points wil decide the second playoff spot. District 8 – Rivals Goddard and Goddard-Eisenhower will square off at Goddard High School with the District 8 title on the line. The winner between the Lions and Tigers is the district champion, while the loser qualifies as the runner-up.